That's so Interesting! : Secret of Youth? I found it ! Whenever we encounter or experience something wonderful, don't we love to gush and tell all our friends and relatives about it? Personally, I consider myself as, The-One-Who-Lives-To-Tell-The-Tale. That's why, I love blogging. I suddenly have an outlet for all my recommendations, opinions, stories, tips that I want to convey... without burdening my friends with my chatter. They can just read about it at their own pace, wherever they are in the world. Recently, I've been gushing over this new daily facial regimen that I am crazy about. Let's face it, we are always in constant search over the best products that we can lather on our faces and neck every night, so we can look as young as our age can allow. No one will admit to being vain, but certainly we all want to present our best to the world! We can only achieve that goal, by taking care of ourselves. How? By great health habits, and choosing the right products. My main skin issues are humongous pores, discolorations and dull-looking skin. I seem to have been born with honeycomb complexion (big excessive pores) that gushes out Sebum as if there's an oil field in my T-zone. The skin discolorations are on my cheeks. They look like I have permanent blush-on... indigo shade. These skin discolorations are brought about by my ignorance to use sunblock when I was still working as a researcher for ABS-CBN. I am always out under the sun, not bothering with umbrellas or hats. Such hassle to bring! So, there! 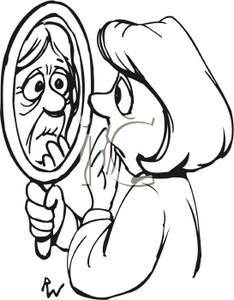 Years of negligence are now showing up every time I look in the mirror. This is a honeycomb, if you haven't seen one. The regimen boasts of a new anti-aging technology called ageLOC. Apparently, Nu Skin, in its collaboration with scientists worldwide,has discovered the internal sources (it's within our genes!) that contributes to aging. I know that recently scientists have mapped out human genomes ~ and I said, “Huh? so what?” But now that they have brought it down to practical day-to-day uses, like better ways to make us look younger, I say, “Now, You're Talking!" This ageLOCtechnology targets aging at the source, that is, our genes. Now, what could be better than that?! This is sooooo far-out from our mother's skincare. My mother's skincare is soap and water, and she considered Pond's cold cream a luxury. But my mother's growing-up environment was Manila circa 1960s, and she now lives in the pristine province of Aroroy, Masbate, Philippines. We live in a totally different era and different environment now, and therefore calls for better skin care. In my mother's time, there was no hole in the ozone layer! Now, the hole in the ozone, is the size of North America. If that doesn't scare you to use sunblock, I don't know what else will. The set contains a Cleanser (which is already a toner, too. So, we skip a step, rather than our usual Cleanse-Tone-Moisturize), a Night Cream, a Day Cream and a unique Serum. It promises to reveal younger looking skin in 8 ways— it will improve the skin’s structure, and texture, even skin tone, reduce fine lines and wrinkles, increase radiance, minimize appearance of pores, reduce discoloration, and increase hydration. I SUPER LOVE THEM and I can't imagine having used anything else! The cleanser/ toner is light and foamy, not those usual, creamy & oily facial washes that's so difficult to wash-off, sometimes leaving your face with residue. The cleanser really makes you feel luxuriously clean, and since it's pre-mixed with toner ~ your skin doesn't feel stripped of moisture after washing. The Future Serum which contains the concentration of the powerful patented formula of ageLOC, is to be applied on the face and neck (treat your face and neck the same! notice how our neck area, is softer, nearby ageing is more evident there!). The Future Serum is what's this technology all about. So, this step is the most essential part! The Transforming Night is applied after the future serum. It's like your usual moisturizer, except that it's not as heavy. It's mild, and when I wake up the next day, my skin is glowing and supple. I love this! I feel so spoiled. And finally, in the morning, I replace the Transforming Night with Radiant Day, which contains the highest-ever SPF (sun protection factor) for a day cream, SPF 22. Normally, that's for sunblock and you know how sunblock feels, right? Greasy, sticky and makes you look like a White Lady. This cream has the same powerful effect of a sunblock (blocks both UV, UVA) but is light and not greasy at all. In fact, I can even use my liquid tinted moisturizer on top of it and pressed powder, too. This one is really not our mother's skin care. I know... for some people, it's a lot of steps just to wash your face. But the era of just taking-off the dirt is no longer here. We're in the age of using technology, to improve our lives. We invest on iPhones, iPads, Blackberrys, why shouldn't we invest in good quality skin care? 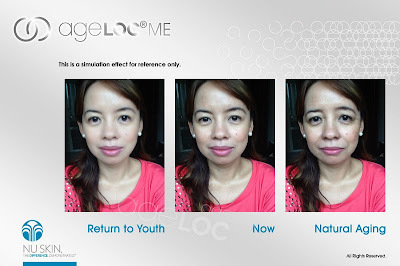 Now, as the simulation promotes, if I use ageLOC ...Taddaaah!!.... Return to Youth!! Let's face it. We can been so cocky sometimes. I already look good. I'm ok! It's the least of my priorities. But most of the times, we don't realize ..... there's always that "little extra" room for improvement! Go for it and Have Fun! I appreciate comments! I activated comments below so that anyone who wants to give feedback/ suggestions, may do so anonymously ;) and you don't need to register to blogger. thank you! Hahahah! Nu Skin should pay the right price for this. Awesome! indeed you found the secret of youth - you got the most amazing discovery in anti-aging... Just by looking at the person's face, I know now how to recognize those who use TRANSFORMATION. Super like your honest to goodness assessment. Brave lady for posting your picture "when you age", how many will do that? I salute you ! Hi ripemango! 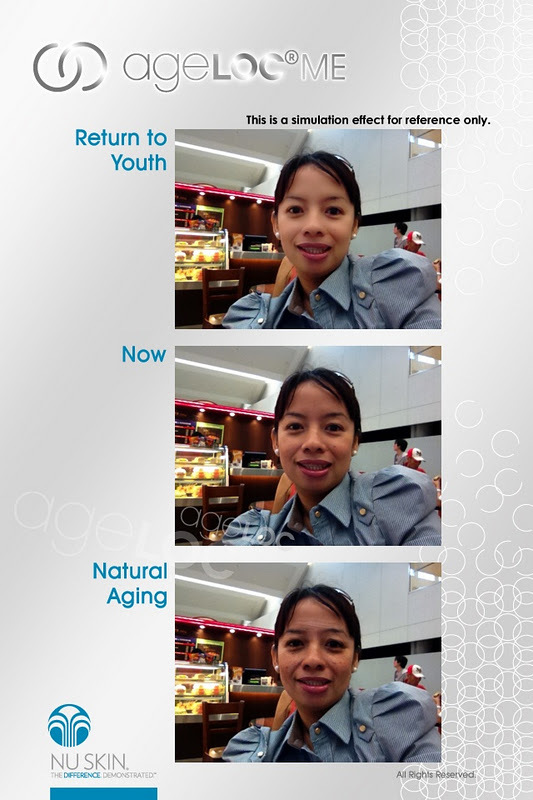 Just finished reading ur Age LOC bloc.Regina was right.Nu Skin should pay you the right price. Very convincing,well-presented & well-written.So proud of you. Keep it up!